The first modern Tarot de Marseille (TdM) that we know of was printed by Pierre Madenie of Dijon in 1709. This deck was nearly identical to its precursors, the Noblet and Dodal. In 1736, Chosson of Marseille printed what was to become the prototype for most later decks. By the mid 1700s, decks nearly identical to Chosson’s were being produced in France, Belgium and Switzerland. Chosson’s deck became the mother of all contemporary TdM’s in 1760 when Nicolas Conver of Marseille copied a Chosson deck directly onto his wood blocks. The Conver TdM became the standard deck in France, and is the model for most of the popular TdMs used today. Although the Pope and Papesse cards were respectful allegories of the Church, 18th century Church officials considered them blasphemous and forced card makers in some areas to replace these cards with other images. 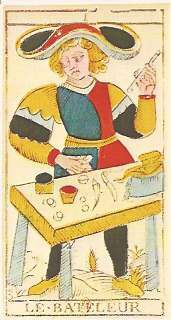 In the mid-1700s, card maker Vandenborre of Brussels printed a typical Flemish-style deck (described on the previous page) but with the Spanish Captain (or Captain Fracasse), a cocky character out of Commedia del’Arte, replacing the Papesse. Bacchus straddling a wine barrel took the place of the Pope. Besancon decks printed in Switzerland used Jupiter and Juno as replacement cards. The distinctive Bolognese deck replaces the Empress and Emperor as well as the Pope and Papesse with the four Moorish Kings. The Church evidently didn’t see the irony of having religious figures replaced by pagan characters. 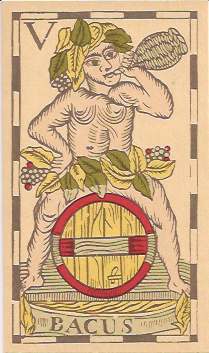 In the 1700s, the TdM returned to Tarot’s birthplace in northern Italy where it evolved into the Lombardy and Piemontese styles. The first Italian decks were identical to the TdM, complete with misspelled French titles. Over time they acquired Italian titles, became double-headed and took on some unique design features. Carlo Della Rocca of Milan designed an exquisitely engraved deck in 1835 known as the Soprafino, which has become the quintessential Milanese deck. Some of its unique imagery includes the Devil sitting in flames and surrounded by writhing green monsters; a red lobster on a silver platter on the Moon card; and a young couple dancing on the Sun card. The stiff court cards of the TdM acquired elaborate costumes, lively facial expressions and individual personalities. The pip cards are decorated with graceful leaves, flowers and ribbons. By the late 1700s, card players had switched to the Tarock deck everywhere but Italy. Invented in Germany, Tarock spread quickly through central Europe and Scandinavia, and by the 20th century replaced the TdM wherever the game of tarot was still played. Tarock decks use French suits (hearts, clubs, spades and diamonds). 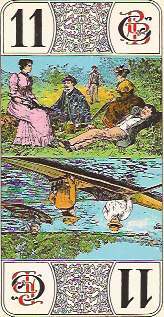 The trumps are double-headed and have decorative images such as animals, rural scenes, or ballerinas that bear no relation to traditional Tarot trumps. While the Tarot de Marseille remained static, Tarock decks, liberated from traditional tarot imagery, became a vehicle for creative expression. After the 1780s, decks for game playing and decks for divination and esoteric studies went their separate ways. The traditional TdM with its medieval trumps and Italian suits of swords, batons, cups and coins, gradually became an old-fashioned remnant clinging to life in a few regions where game players hung onto their traditional decks. Eastern France was one of the last places to convert to the new Tarock decks. This gave 18th century French occultists an opportunity to adopt the TdM as their own, preserving the traditional TdM deck from historical oblivion. On the next page we’ll see how French occultists radically re-imagined Tarot while retaining the original structure and imagery. 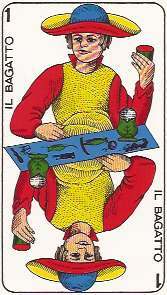 Click here to read about how the Tarot de Marseille developed in the Piedmont region of Italy.